This week, manufacturing data from the two largest economies in the world dominate the key economic releases space – with the United States reporting at the start of the week and China closing the week with theirs. But the mid week will be when investors worldwide will be keeping their eyes peeled as the United States release their GDP data – the biggest indicator on whether the U.S economy is recovering. 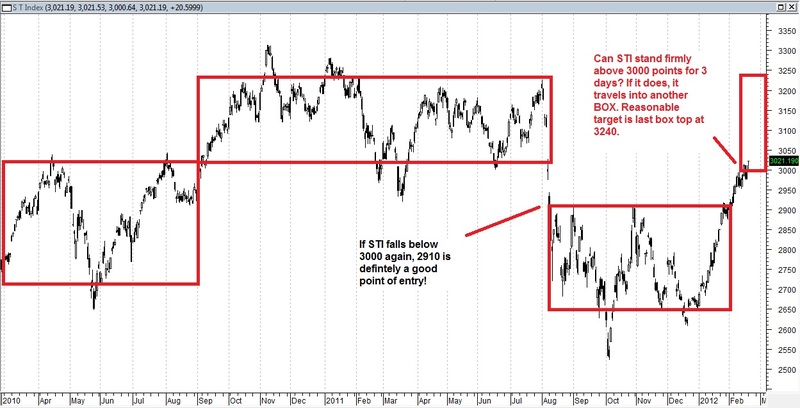 Trading strategy wise: STI index drop below the 3000 mark, making the previous peak 3030 as our next resistance. 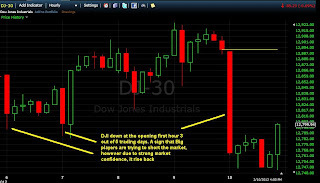 As mentioned in previous email, we expecting market to pull back, and indeed the market did pull back this few day. However the pull back is not as much as what we expected. The market hardly fall, hence being bullish is still reasonable. We encourage you to enter Only when the Price of stock Break above previous day high. Lastly, attached the dates of companies Result announcement for your reference. After going on a holiday trip to Malaysia and Thailand, I am back. Energised and Rejuvenated. Make some $ on Apple also, great that my expense is covered. It probably will run till its Product conference on 7th March with the new release on Ipad 3. Potential play still to that day! If it manages to reach $547, please liquidate. And always remember to sell before the release. This is the economical reports that will be released in US this week. 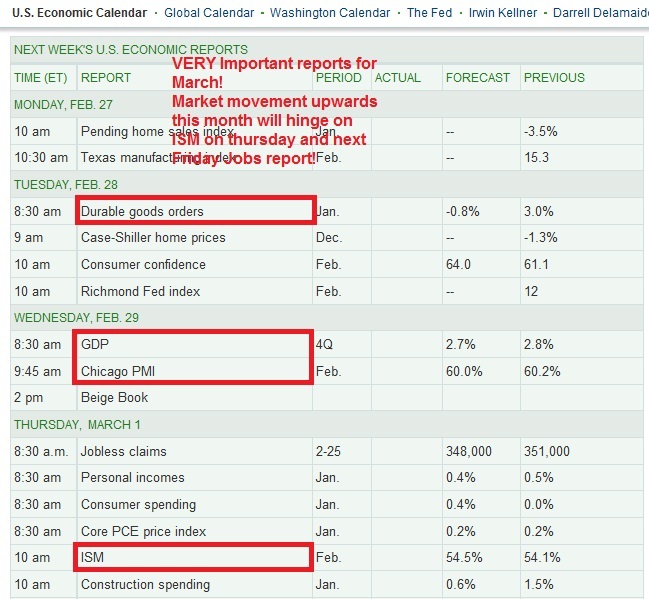 Keep note of Tuesday's Durable Goods, Wed's GDP and Chicago PMI, Thu's ISM which I think will affect this month's progress. Would give a Full article on my comments and take on the week. 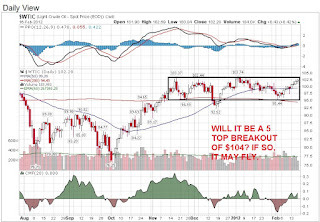 US Stock Tip: Apple still so STRONG : It is VERY likely to hit $525 again! Recently I played Apple again. Just buy a straight call 3 months away. 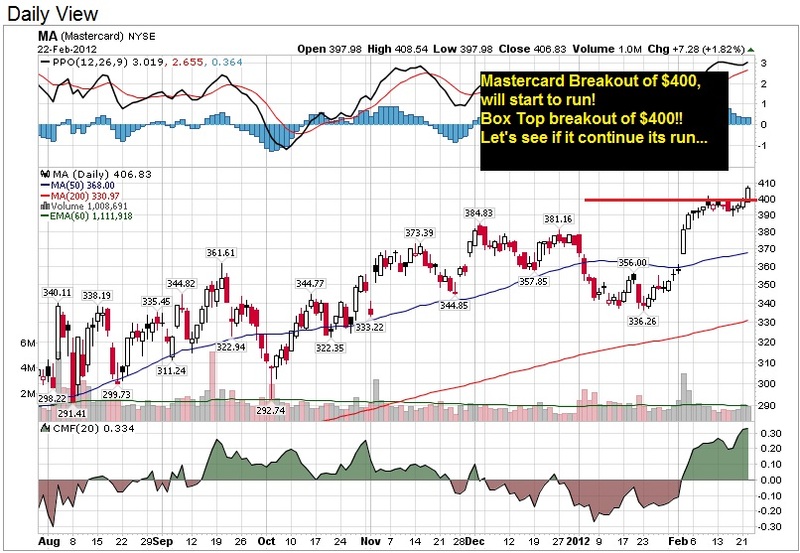 It is likely to continue its upwards movement towards $525. It is at $522 now. See if it can break through $525. My strategy is at $525 if, after making a bit of profit, I will put stoploss at breakeven. There is likely to be a resistance there. But I am hoping there might be a breakout. For those who have attended my whole options class, you may trade this strategy. For those who aren't, please don't execute this move as you are not trained yet. The thing is I have been a Stocks and Options Trainer and Trader all these years. Some of you might think:" I only like stocks, I don't like options". I would encourage you to have a more open mind to trading. It is a matter of fact to me that Learning options has GREATLY enhanced my skills as a trader! It has helped me in STOCKS analysis so much. And the best thing in options is that it can be used as a hedging tool against stocks. In fact Warren Buffett and hedge fund managers use it. Recently I discovered that OCBC also invest in Warrants to sell as a hedging product to clients too! If you like, you may register for our "Secrets to US Stock and how it affect Singapore Stock" session to know more about our class. 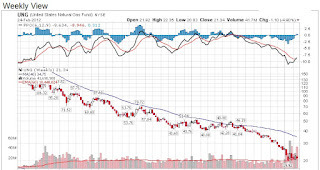 Question: Would like to seek your opinion on United States Natural Gas Fund (NYSE:UNG). No kidding, this stock went from $100 plus to recent low $19.92. Basically I think Natural Gas may have hit its bottom. 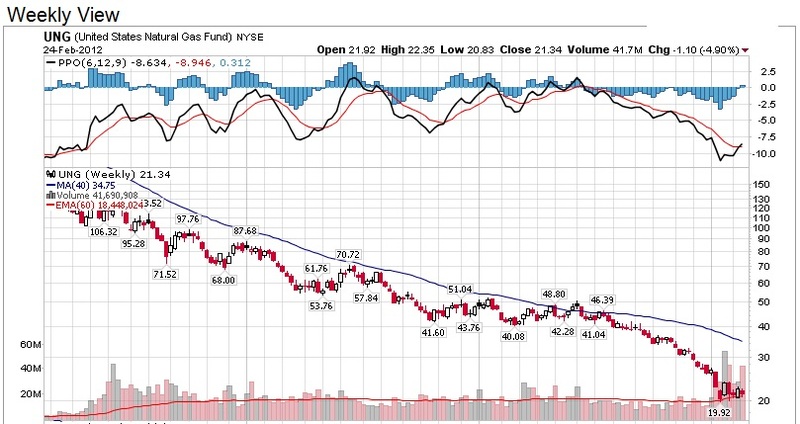 With the Crude oil going higher, natural gas price may kick in higher now. Having said that, natural gas is a political issue. Currently Us govt policy is not pro-natural gas. Not a lot of policies is towards the usage. Of course Obama got pressure from Crude companies not to have policies to start using natural gas as widespread alternative. A push in the policy change to use natural gas would definitely ends this fall. And I think with rising oil price, he MIGHT just do it to garner support for the election. Updated: Never Hold your stocks through Earnings when you are a Short Term Player! "Thanks for your tip/sharing. I think many of us experienced that. But after gap up, at what price we should take the profit? It is really difficult." 3) Use time based system. Eg. Contra players never hold positions after contra period. Day traders never hold after Day close. Weekly Traders close on Friday. Basically for Earnings play, it is a MUST you should exit b4 earnings day. which I called "Law of Gravity of Price" which I teach in my class. Sometimes even without looking at charts, I know the next support and resistance because there are prices that have the most volume which acts as support and resistances. 1) Get out immediately at the OPEN. No kidding. After a big gap up after earnings, immediately sell at the open because this stock needs a rest before running again. 95% chance this stock will rest. 5% are for those stocks that are having a lot of shorting. 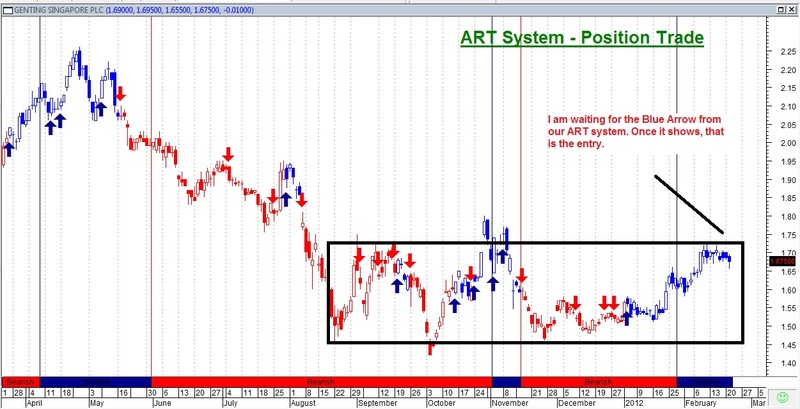 Shorters who are caught in the gap up need to cover positons and hence the stock continues to climb. In my course, I teach people how to screen out those stocks that are hugely shorted and will carry on up for days. 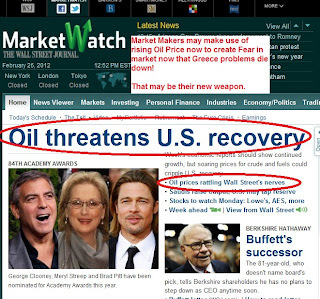 Market Makers may make use of Oil as their new Weapon to bring Market down! It is always interesting to keep track of headlines of influential websites. Basically my strategy as a trader is never believe in the news! Ha, you may ask, "Then why did you keep track of the news if you do not believe in it?" Well, after years of trading in the US market, I discovered that whenever the stock market has a great run, market makers or big boys, who manipulate the market, will try to create bad news to bring the market down. Now that Greece problems die down temporarily, they NEED to try to find new STORIES to scare the market. It is their only way to play against the market! RISING OIL PRICE may be used now. See the headlines over the weekend in marketwatch. Knowing their latest strategy is very important! That is how we think and play like them! The Europe story has been going on for so many months, they need something new. Oil is great for them now. So what is the strategy for us now that we know their mindset??? My suggestion is you may want to buy oil related stocks or Oil related ETFs like "OIL", "OIH" or "USO" in US, or basically trade OIL FUTURES to hedge your positions against stocks. I have been trading OIL Futures through my Forex broker and make some money after Light Crude breakout of 5 tops as mentioned a few weeks ago. It is flying now! Never Hold your stocks through Earnings when you are a Short Term Player! Genting, China Aviation Oil, Wilmar these few days have something in common. They gap down after reporting earnings miss. For some, you see your profits wiped out in 1 day. I always explain in my class not to hold your stocks through earnings. This is from my experience trading in US Market for the last 8 years. In the past, I like to speculate if a stock will have good earnings and buy in just before the earnings announcement so that I could profit from the Gap Up. There was one time my bet was wrong and I lost US$25,000 in one night. It taught me a valuable lesson! As a trader who constantly makes money, we don't like RISK. We love certainty only! And holding position over earnings is like holding a time bomb in your hands! Unless of course, you invest stocks like Warren Buffett, for the long term. But for those that can't stand seeing your profits vanish, why don't you profit take when you already make money from the stock run-up before earnings? Just get out first! There are opportunities to play again, after earnings. This is one valuable TIP I am going to give you in investing. In my course, I teach investors how to play earnings before and after, which I think is a giveaway gift from the market to make you great money because every stock got their characteristics before and after earnings! 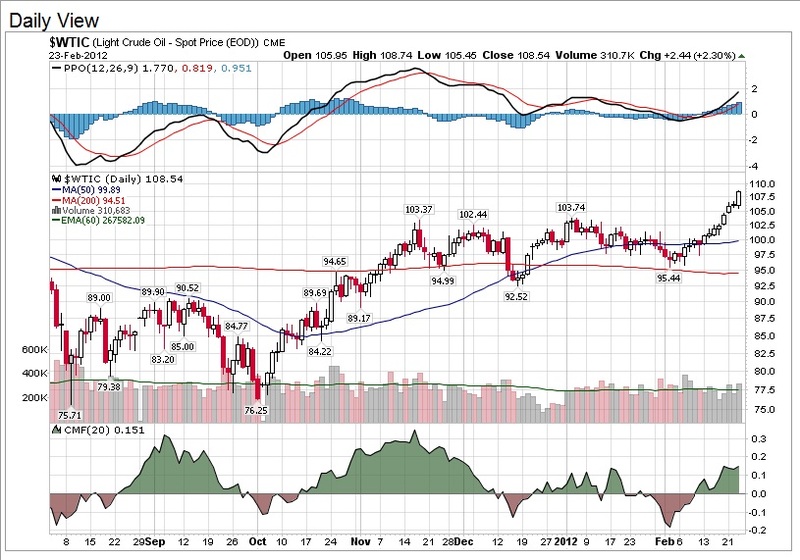 I mentioned that you may look at Crude Oil. Indeed, see how it flies now. With Iran problems still around, there seems to be no stoppage of this momentum. Let us see if it goes to $114, the recent high. May have slight resistance at $110. But do take note that with this oil price going higher, this may become a problem to the earnings of some companies. Currently, we are burying this problem amid the Bull Run. 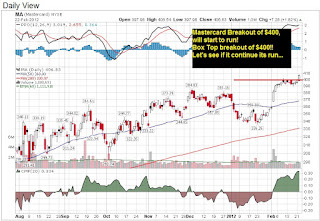 US Stock Tip: Mastercard (MA) flying off $400 with a strong breakout! For Options Graduates, may take the chance to go for straight call. However take note of slight resistance at $410. But remember our course rules before going in for straight call! 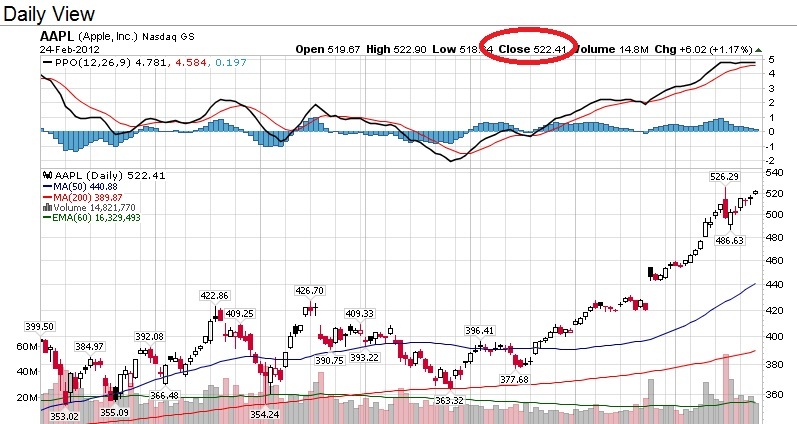 As Hu Li Yang mentioned, STI needs to stand above 3000 for at least 3 days. However STI failed on the 3rd day (which is yesterday). So we could not say it has succeeded in breaking through 3000. Today STI continues its fall. Dow Jones similarly hit 13000 points before retracing to 12939 yesterday. I would suggest don't go into the market now. 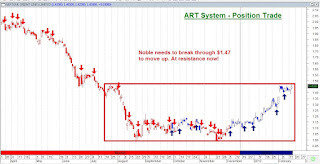 Especially when these major resistances are still in sight. Like what I say in my article, I would also suggest keeping your eyes on STI at 2900 and Dow at 12700. If they falls below that figure for 3 consecutive days, you may want to liquidate your positions. Singapore Stock Tip: Genting Earnings Tonight: Will this stock Comeback like CAO? Genting did not perform to expectations for their earnings results. That is the reason for their gap down of 35cts at their open. Forget about this stock now. I am closely monitoring the progress of Genting. I like stocks that miss estimates for consecutive quarters. Bcos it just take a nice quarterly earnings to make the stock come back. I am preparing with all my ammunition! You should too! 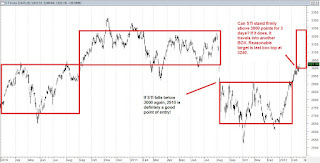 Article by Andy Yew: Looking for some Singapore Stocks for Shorting/ Hedging? 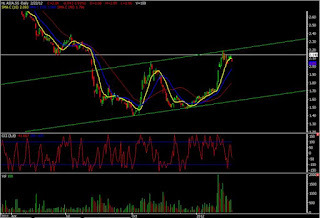 Can look at HL Asia, now is near the Top of the Parallel Channel and it is turning down. Today it trade below the previous day low, which might seems to be a entry point for shorting using your CFD. Singapore share prices closed higher on Tuesday with the Straits Times Index up 3.88 points to 3,025.07. Volume was 1.88 billion shares worth $1.55 billion. Losers marginally led gainers 213 to 203. Market is keep surging and currently it is very over-bought now. Many of friends has been asking what counters to buy and what should they do with their current holding position. Well, below are some advise. 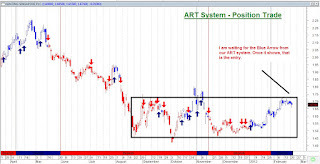 Although market is very over-bought, the ART position system is managed to screen out below counters for your consideration and time frame is 1-3 months. Pls. do your home work and plan your trade properly. Enter only when it price is higher than previous day high price. Lastly a stop loss is a MUST. Will STI Stand Above 3000 Firmly With Greece Problems Out Of The Way? 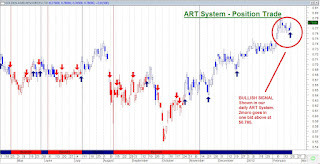 Based on the teachings of Asian Leading Investment Guru, Mr Hu Li Yang, the only way the Straits Times Index (STI) will continue its movement upwards is when it closes firmly above 3,000 points for at least 3 days without pulling back. 20 February was the first day. Then it travelled to another box and stayed there for at least three months. In the new box, the STI is expected to continue its ups and downs. (Please refer to the chart). In my last article, I mentioned that for the STI to break through the 3000 points barrier, and for Dow Jones Industrial Average (DJIA) to stand above 12,938 points, we need help from Greece and a good Economical Report. Last Tuesday, US’ retail sales report did not help lift the DJIA, as the released figures were below expectation. However the “lift” came on Thursday night with a terrific Jobless Claims report that is at a 4 year low. Housing Starts report also indicates that US housing prices is about to climb, after a 4 year slump since 2007. I expect US housing prices to continue its climb this year given the US election in November and the all-time low interest rates. In fact, US companies like Lowes Company (LOW) and Home Depot (HD) also reported terrific earnings figure. 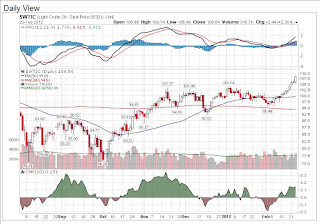 In the US, the oil tanker industry seems to have found its bottom after so many successive bad quarters. With oil prices that high, one may think that the tanker industry should be doing great. However it isn’t. The reason is that there has been an overwhelming supply of ships. With Europe in deep trouble, the whole shipping industry throughout the world has been affected. However recently, Frontline (FRO), a famous tanker company listed in the US, recently spent US$100 millions of dollars to buy new ships, which indicates a bottom in the industry and a sure sign of confidence returning. How can you capitalize on this? My advice is it is time to look at our local listed shipping companies like COSCO and YANGZIJIANG. They have potential to be the big plays of this year. What is our advice for trading this week? 1) We think that the STI should stand above 3,000, and DJIA should stay above 12,938 points to move into the new box. However we expect a resistance at the 3,100 level. The STI might pull back to test 3,000 points again. 2) We expect the STI and DJIA to march forward this week. 3) However do be careful on the mid and end of next week. There might be a temporary turnaround. I would touch on the reasons in my next article. on 22nd Feb (Wed) English Session OR 23rd Feb (Thu) Chinese Session. Singapore Stock Tip: China Aviation Buy at $1.23 as told 2 weeks ago! Remember? I do not know whether you remember my last post on China Aviation Oil. I mention that you need to sell first at $1.20 as there is a resistance. Indeed everything goes EXACTLY according to what I mentioned. Perfect! 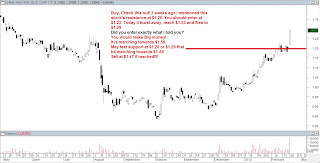 On 7 February, I wrote this article: "Congratulations on China Aviation Oil (CAO)"
In that article, I said go in at $1.23 after it rest a while! This stock will fly again! Check out that article. Indeed a few days ago, the highest price it reach is exactly $1.225 before consolidating for a few days. 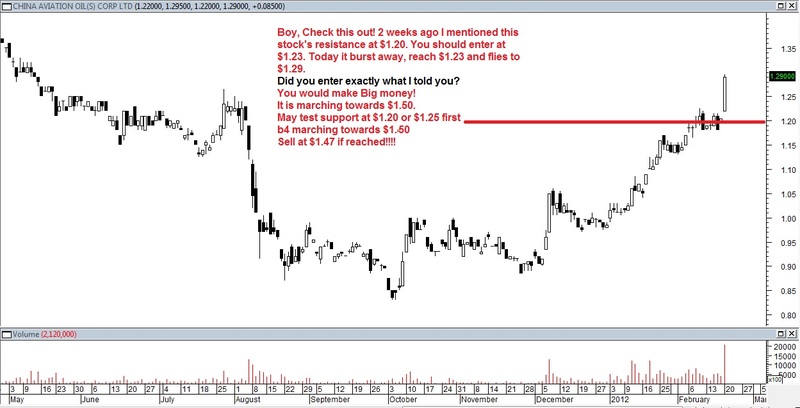 The reason why I say go in at $1.23 is because based on my trading experience, stocks has a high chance of continuation after adding 3 cts to a big psychological figure. I find it so amazing that this stock follows my call exactly. Today it reach the price $1.23 before bursting through to end at $1.29. 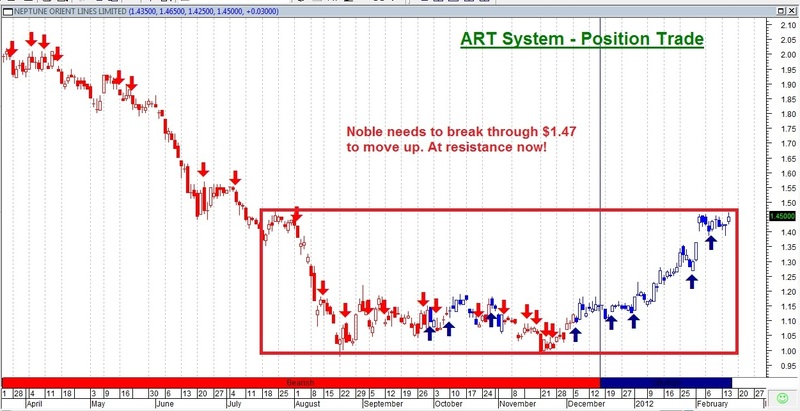 Sure looks like a great breakout! So my prediction is for this stock is that it has a BIG resistance at $1.50. If it happens to travel there, sell first 4 cts below at $1.46. 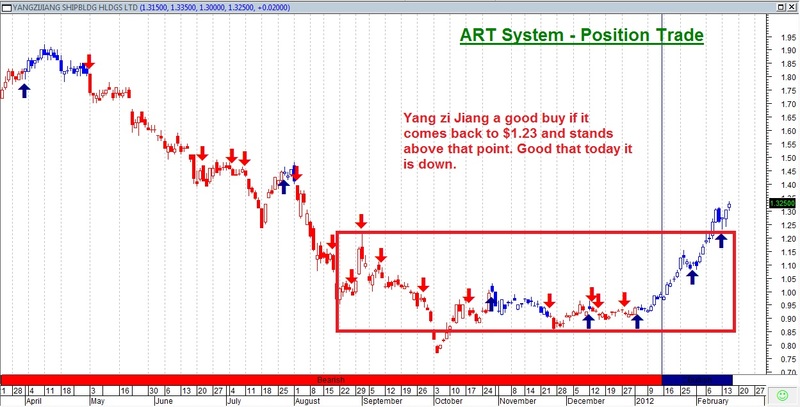 However before that, it may consolidate for a while, may try to test $1.20 or $1.25 before running again. Catch it if it manages to lift off above that figure. 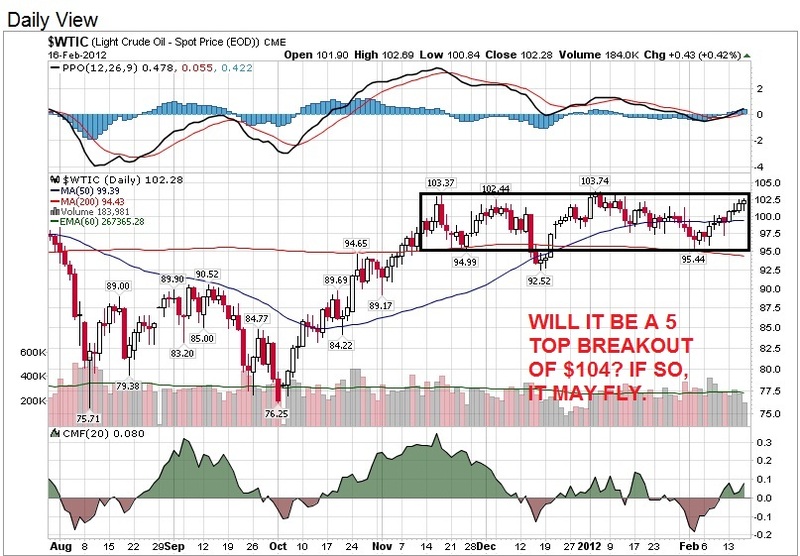 Will Light Crude Oil break out of 5 Tops this time? With the Iran uncertainty, it might just break! May use it as a hedging tool against your stocks asset! Amazing Dow Ascending Triangle Trend still intact, Will 2moro be a GOOD Friday for DOW? Wait for it to drop back if possible to support at $1.23, needs to stand above then may enter. Yesterday, U.S. stocks ended solidly lower Wednesday after minutes from the latest Federal Reserve meeting nipped hopes for more quantitative easing and amid uncertainty over Greece.Plus by mid noon yesterday, the BIG juggernaut APPLE falls big time from $526 to $500 within minutes. It certainly shake the whole market. I feel that Apple has run its course, and badly needs a rest. 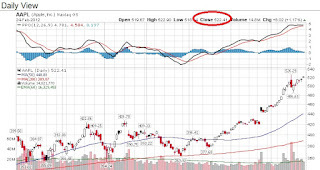 Ever since our last article recommending Apple, it has run from a after earnings price of $450 to $525 within a few days. Now STI because of last night Dow 97 points fall, is back within 3000 points. As I have mentioned, there isn't any economical report or good news that really provides a boost for Dow to breakthough 12938. Not the badly missed Retail Sales on Tuesday which is below expectations. Until it does so, we should be cautious and good to be on the sidelines. Hence no recommedation now at this moment.... Let us be PATIENT! As I have mentioned in my blog, today's Retail Sales estimated figure might be a bit too high as January figure does not include the festive December month, I can only keep my fingers crossed that it beat the estimates of 1%. Today the figure is 0.5%, less than the estimates. It didn't beat. 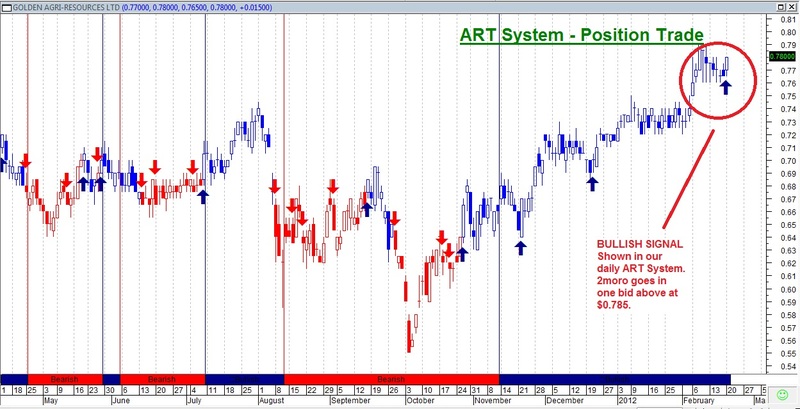 You may take a look at my last article: Will STI and DOW survive this Bulllish Run? That is the reason why Dow Jones decrease by 45 points now. Decliners defeats Gainers 3874 to 1731 stocks. With retail sales down, we can only look forward to Wednesday's Greece decision on Euro zone & Thursday's Housing Starts and Philly Fed to ignite Dow towards 12938. I am more inclined to think that Greece would not make a decision to leave the euro zone. The good thing to get out of this Down Day is that the market hasn't dropped much even after this Retail Sales, which is a HINT that DOW might just break 12938, and STI breaking 3000, just that we need a Good news somewhere to ignite a rally. The danger of course will be when DOW drops consecutively for 3 days, more than 100 points in a single day and drops below 12700. That is the time to liquidate positions. For Day Trading, I care less about the market direction. These few US Stocks are the ones I like today. If it crosses yesterday high, I may go in. Let us see what happens at 10.30pm Singapore time at the open in US. 16th Feb (Thu) 7pm - 10pm: Chinese Session. 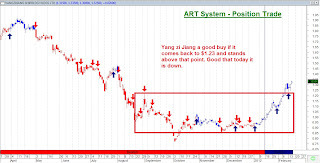 Mr Hu Li Yang is precise in anticipating 12938 is resistance for Dow n 3000 is resistance for STI. On Thursday Dow hits 12924 before retreating to end at 12800 on Friday. STI hits 2992 points before retreating to end at 2960 on Friday. It shows the resistances are strong at 12938 for Dow and 3000 for STI. From last Mon to Friday, the market showed its resilience. Currently there seems to be some Big players trying to short this market. Especially so for Dow, which open lower in the first hour of trading in 3 out of 5 trading sessions. 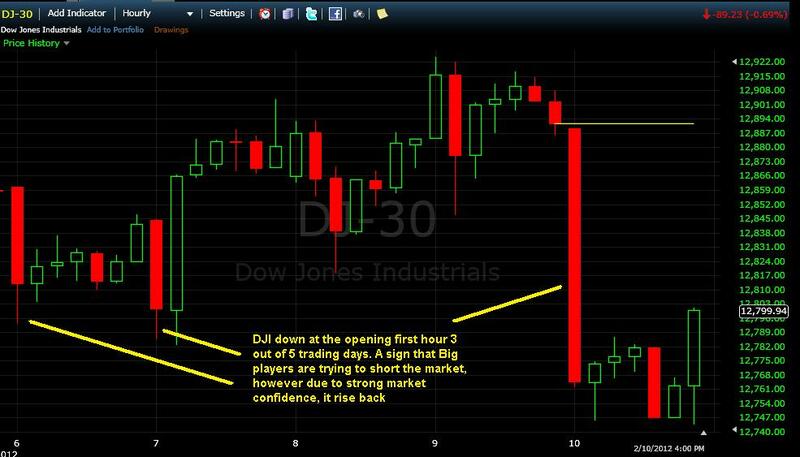 (Pls see our chart on Dow for this week). Last Friday is a chance for the shorts after uncertainty over Greece’s ability to secure a second bailout and to avoid a messy default. Do note that Greece is set to vote on the measures over the weekend according to PM Papademos. And Greece will need to decide if it will stay in the Eurozone by Feb 15th. The Big boys finally got their chance to push it down 100 points at the open last Friday. However, it came came to close in 2 digits. It will be interesting to see how Dow opens on Monday. Although the resistance is strong, do we have a chance for the breakout? Yes, but probably with the help of a STRONG economical report and Greece decision this week. We definitely need a hugh lift to breakthrough. On Tuesday, Retails Sales will be reported. A good figure from it is a must. However, expectations is high at 1%, much higher than last month's results of 0.2%. Do take note that for January Retail Sales, christmas may have already been over. This time I am really keeping my fingers crossed. 1) You might not want to enter any positions this week as there will be uncertainties again from Greece. Profit take if you may. Wait for more positive news. Anyway, I also suggest we wait for STI to clear its resistance of 3000. 2) Pay attention to Retail sales on Tuesday which I hope will beat expectations. 3) Technically, if STI close below 2900 and Dow close below 12700, for 3 consecutive days, this run may be over temporarily. It might signal the start of a decline. Try to liquidate your positions then. 4) If STI burst through 3000 and Dow burst through 12938 for 3 consecutive days without dropping back, this run might continue. So this is definitely one crucial week for STI and the DOW. It may be D-Day! Stay tune for further updates! on 18th Feb (Sat) English Session OR 21st Feb (Tue) Chinese Session. There is a similarity to this week trading in US market. The strong resistance level on Dow Jones Industrial Average is capping it, trying to push it down each day. However it seems all attempts to short it failed. Today is a similar story. DOW begins its descent down after the open, but came back by miday. Now at 2.20am Singapore time, it is in the green, and hovering above 12900 points. This only proves one thing. The Resistance is strong, however the market confidence is STRONG also! 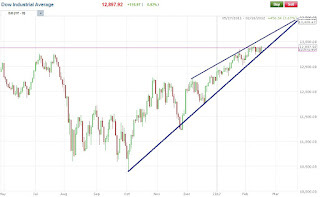 My prediction is that Dow will break through 12938. It just need a SPARK to light it. This week there are no important economical news to light it. 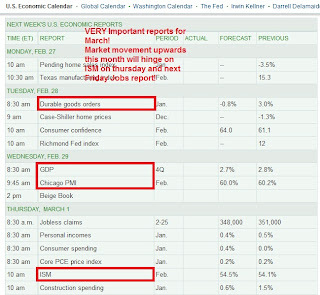 Let us watch out for Next Tuesday Retail Sales. This is an important report. The analysts are predicting that january retail sales will be a lot higher than december. I don't know if bar is raise a bit high. IF it beats, it might be the spark for Dow to end 100 points higher. 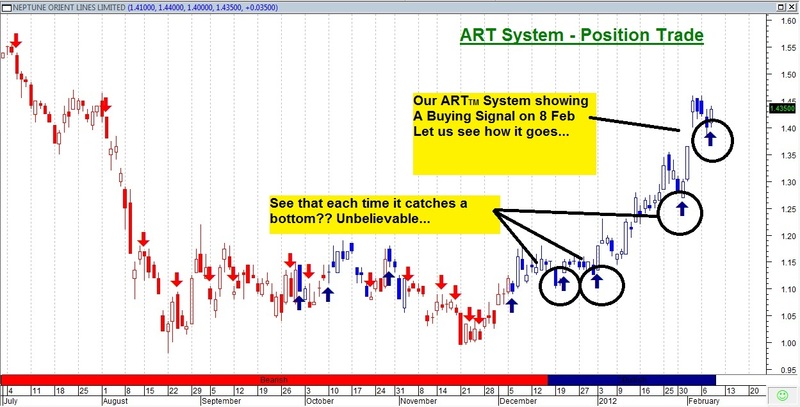 Using our ARTTM Position Trade, it shows a buying signal yesterday... Pls check the chart. 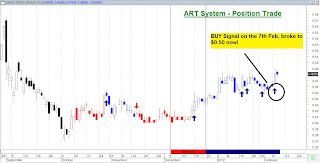 CONGRATULATIONS for our ART class graduates who make multiple entries on this stock recently! 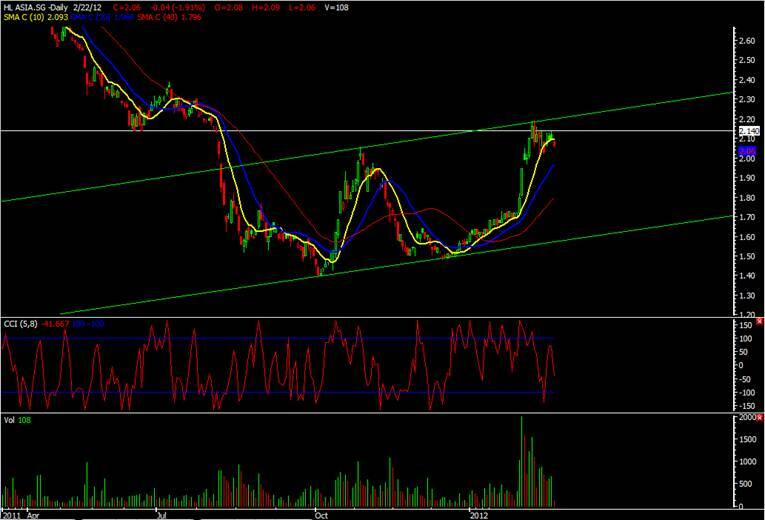 Sheng Siong Go Go Go! The day before we recommended to watch this stock when our ART screener showed a Buying Blue Arrow using BOTH our ART Swing Trading System and ART Position Trading System. on 10th Feb (Fri) English Session OR 13th Jan (Mon) Chinese Session.